Candy Girl | "blackberry-eating in late September"
Sometimes, it’s not enough to just cook beautiful, delicious food (she said modestly). Sometimes, you have to make something really special, just because. 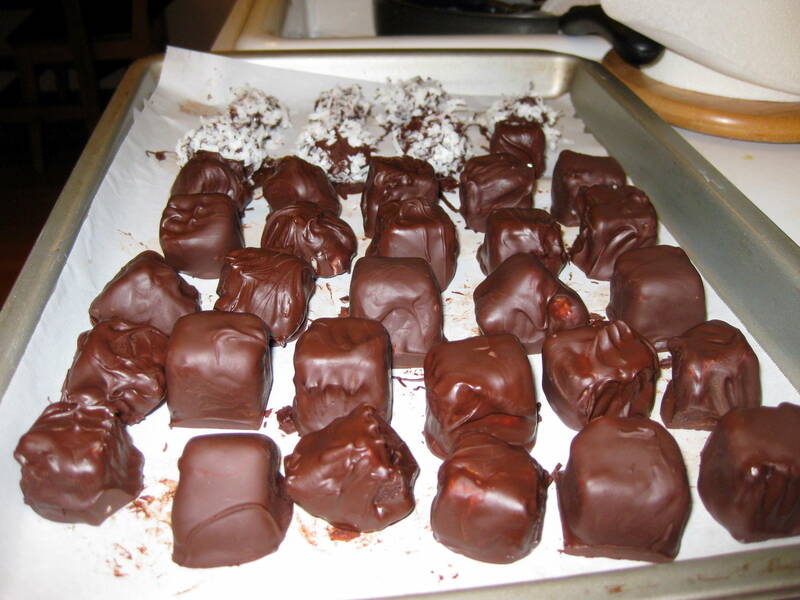 Yes, these are chocolate truffles. Yes, I made them by hand. I did not make them by imagination, though. They were created thanks to the February issue of Cuisine at Home magazine, and an unintended modification to Elana’s Pantry’s nut butter balls. First you have to make two kinds of chocolate ganache. One contains bittersweet chocolate, heavy cream, and crème de cassis. It gets poured into a plastic-wrap-lined loaf pan and refrigerated for an hour or so, just until firm enough to maintain a solid top surface. The other contains white chocolate, heavy cream, and almond extract. I didn’t have almond extract, so mine contained amaretto. This gets layered on top of the dark chocolate and chilled. I left it in the fridge overnight. Then, when everything is firm and solid (as solid as ganache gets, anyway), you pull it out of the loaf pan by the overhanging edges of plastic wrap and cut the block into truffle sized squares. While you are releasing and unwrapping and cutting, melt some additional chocolate, dark or semisweet this time. Just pure chocolate this time. 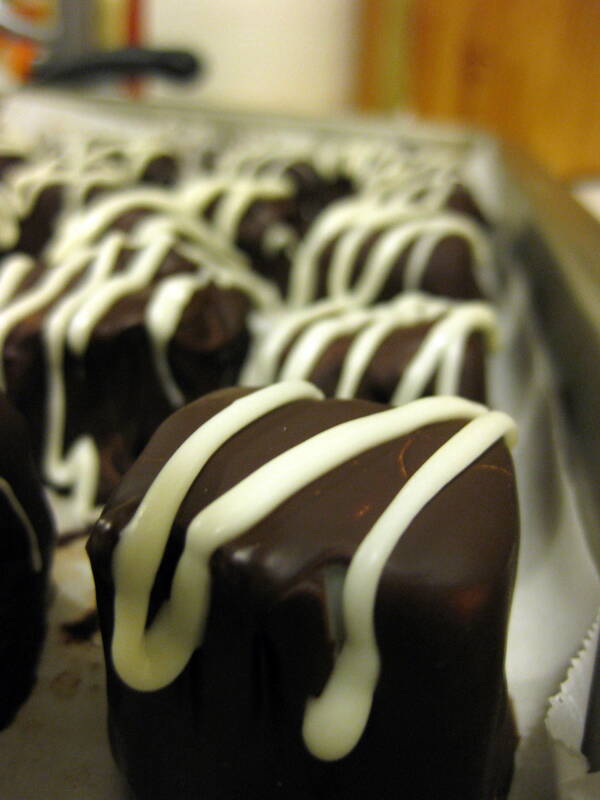 When it was smooth and luscious and liquid, I used two forks to quickly dunk and coat each ganache square before transferring them to parchment paper. This was a pretty systematic process, so I got thinking while I was working. I had some crunchy almond butter from Trader Joe’s, and a few weeks before I had drooled over Elana’s nut butter balls. Why not make some myself? On a suggestion from her comments thread, I mixed the almond butter with a few tablespoons of powdered sugar in hopes of firming it up a bit. Then I stuck it in the refrigerator to chill it and maybe make it easier to form into individual pieces. 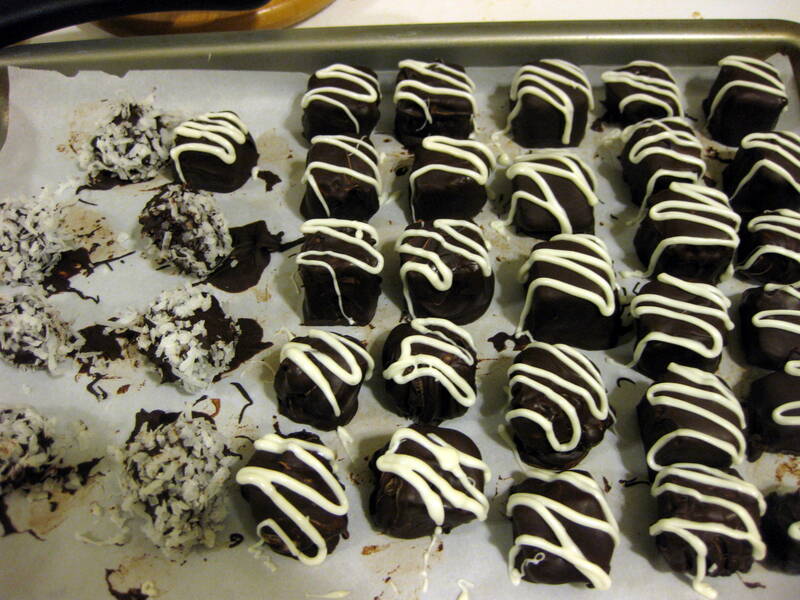 While that was chilling down, I finished the first set of truffles. I melted some white chocolate chips in the microwave, scooped the sweet goo into a plastic bag with one bottom corner cut off, and squeezed out a nice drizzle over the tops of my little soldiers. Just to change it up a little, I rolled some of the smaller squares in shredded coconut. Isn’t that gorgeous? Now, I’m no Bakerella, but that looks pretty darn impressive to me! After encasing each little chocolate triumph in mini muffin papers, I stowed them gently in Tupperware and took out the nut butter. I rolled five balls. It was decidedly not firm. I decided to freeze the individual pieces on a plastic cutting board to solidify them before dipping them in warm melted chocolate. I pushed the board onto what looked like an empty shelf in the freezer. It was not empty. The almond butter mashed all over a gallon freezer bag full of salmon. I sat down on the floor and just stared at the delicious mess I had created. How to fix this? I scraped off as much of the nut butter as I could salvage and, in a moment of minor genius, added it to the bowl of melting semisweet chocolate chips I already had on the stove, ready to receive its next set of victims. The almond butter melted in nicely, and I was able to pour my little disaster in a bread pan to cool and cut. Remembering Elana’s suggestion, I sprinkled the top with coarse sea salt. Brilliant. 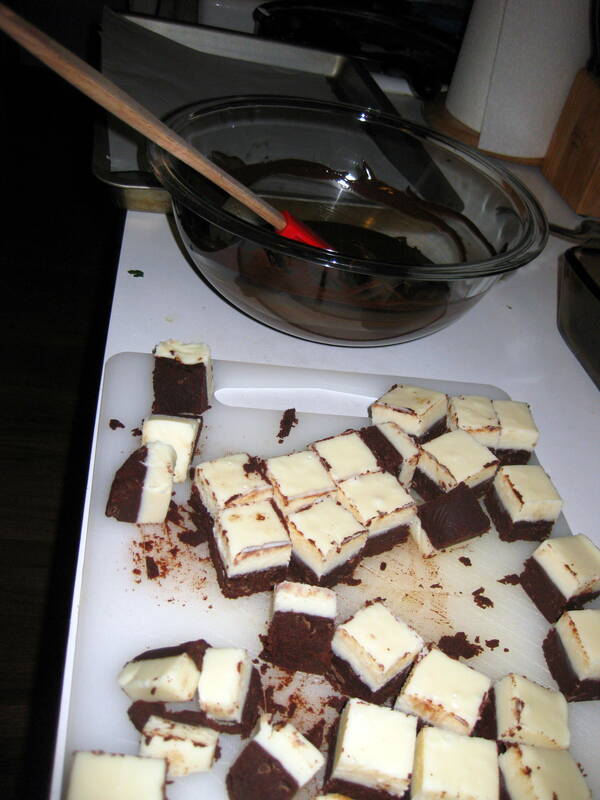 Cut into squares, it was a perfect mixture of texture and sweet-salty contrast. 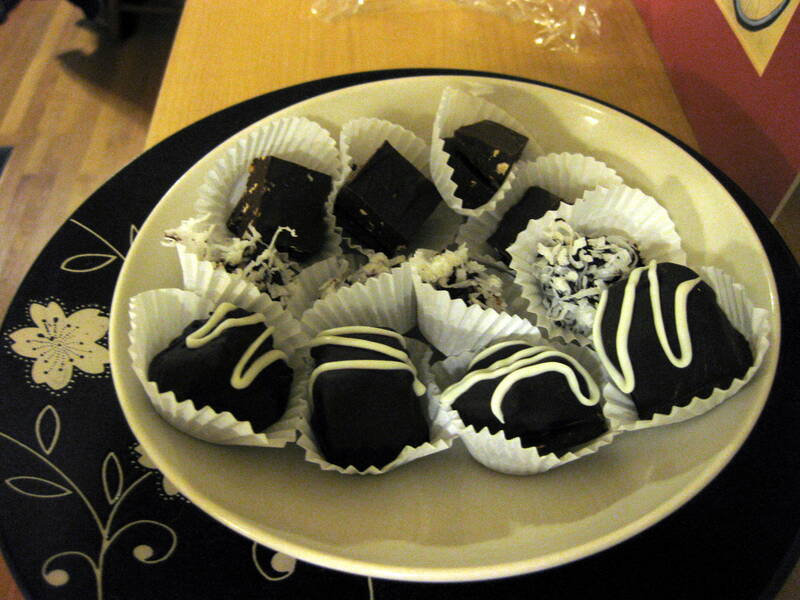 And the truffles weren’t bad either. The tuxedo colored layers of ganache inside the slightly crunchy chocolate shell are visually stunning, and have a very subtle liqueur flavor that somehow enhances their chocolate-y richness. They are impressive to look at, mouth-coating-ly opulent to eat, and better than anything you will find in a See’s candy box. I brought small plate offerings to my officemates as thank yous for how supportive they have been toward me as I studied for my exam. I read about and admire those people who can make mixed platters of sweets for holidays. My Nana was always one of them. Now, it would appear, I am fast amassing the skills and recipes necessary to do the same. Maybe I should start taking orders. 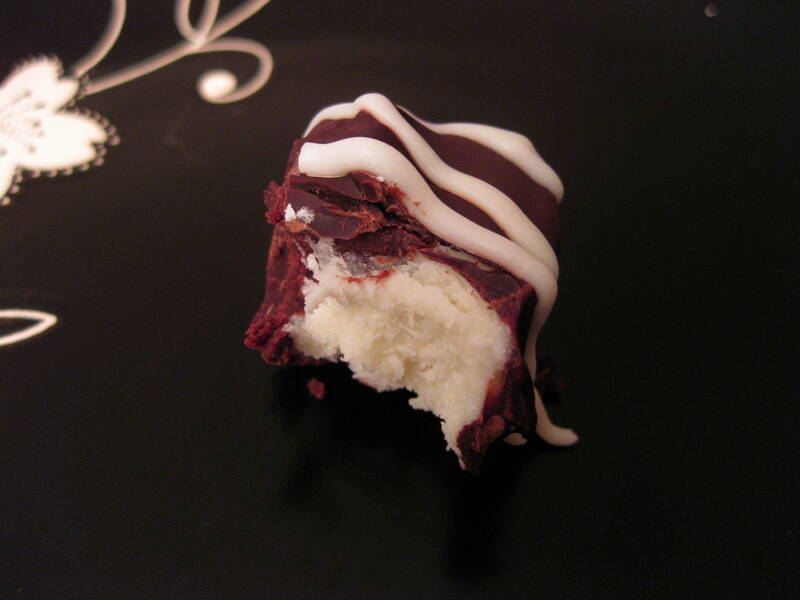 This entry was posted in Bibliophilic, chocolate, Dairy, Desserts, Gluten-free, Sweets of sin, vegetarian by Chelsea. Bookmark the permalink. Pingback: Candyland « "blackberry-eating in late September"